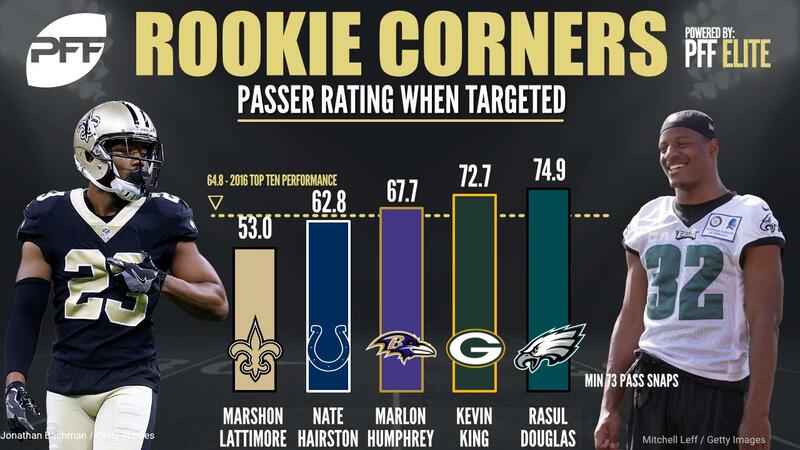 Through his first five games, New Orleans Saints corner Marshon Lattimore has lived up to his pre-draft expectations and then some. His passer rating allowed of 53.0 is tops among rookie cornerbacks, and his 0.71 yards allowed per coverage snap checks in 17th at the position. A fifth-round selection by the Indianapolis Colts this past April, Nate Hairston has really turned some heads. He leads all rookies allowing a reception once every 16.8 coverage snaps, and checks in 11th among all corners allowing 0.54 yards per coverage snap. Despite being targeted once every 4.6 coverage snaps, Marlon Humphrey of the Baltimore Ravens has embraced the challenge. His 67.7 passer rating allowed ranks third among rookies and 25th in the league. Kevin King of the Green Bay Packers has been targeted in coverage even more frequently at a rate of once every 4.5 coverage snaps. Despite that, he has held his ground, holding opponents to a passer rating of 72.7 across his 22 targets. Even though his 1.66 yards allowed per coverage snap ranks 96th amongst all corners, opponents have had trouble against Rasul Douglas of the Philadelphia Eagles. His passer rating allowed of 74.9 ranks fifth among rookies, and has recorded two interceptions which leads all rookie corners.